A predator that has become a vegetarian. It is a species in the bear family living on bamboo, but will it find a little meat it well to taste good to the panda. 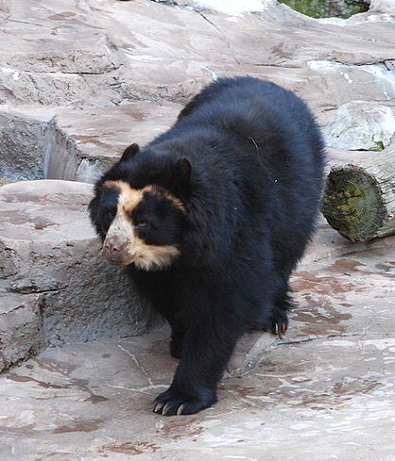 Its closest relative is the only bear in South Amaerica, Spectacled Bear who lives in northern Andes. It is estimated that there are between 5000 and 30000 of this bear. 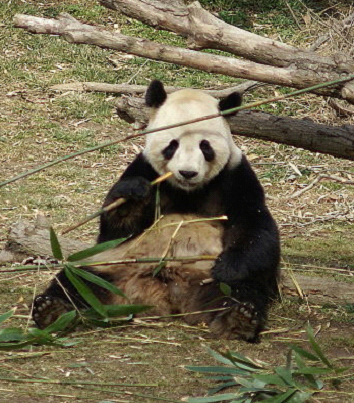 It is similar to the panda in that it eats mostly vegetarian stuff, fruit and shoots. Only 5-7% of the diet is meat as Wikipedia says. It is short faced like pandas. See picture. In the case of pandas, we have been led to believe that it is endangered. But not today. In the wild, we know of over 1600 but others appreciate thenumber to 3000 based on DNA studies from feces. "In breeding center in Chengdu, they are now so numerous that they do not know what to do with them but pandas are useful in diplomacy," writes Eirik to me. It is 40% more than what they knew in the 90's. Pandas have always been rare. Best way to save them for posterity, of course, is to save their habitat. I've only seen a live panda once in my life. It was at the London Zoo in the 70s. A panda sitting relaxed and reclined and ate bamboo leaves. A peaceful predators that are solitary, meet each other only by mating. The giant panda I saw was sitting like the panda in the image below.